Take your entire collection with you! 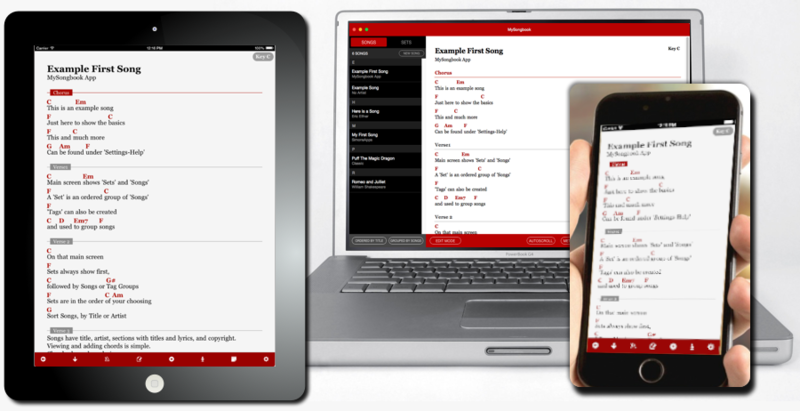 MySongbook is available as a Universal (iPad, iPhone, and iPod) iOS App as well as a Mac App. Get your copy today! No more carrying around your heavy folders and music books, your iOS device is now all you need for your chord charts and guitar tabs. Take your entire songbook of chord charts wherever you’re going to be performing or practicing. Create Set Lists and switch between your songs with a quick swipe. You can also transpose your songs to the key you will be performing them in, as well as setting a capo position which will automatically transpose the chords for you. MySongbook supports AirTurn and PageFlip ‘hands-free’ page turners. You can now switch between your songs without having to touch your iOS device.